The eGo T electronic cigarette starter kit is arguably the most popular and "classic" electronic cigarette innovation that has come out of the eGo family. The eGo-t vape pen comes with tank cartridges, which hold 1.1ml of juice, drips e-juice directly into the atomizer without the need of traditional cartridge fillers. This process produces phenomenal vapor and maintains a strong taste for the user. This Ecig is definitely a must have for all vapers and at this price, these vape starter kits are undoubtedly the best cheap vape pens online. The egot vape pen clear atomizer is the combination of eGo-w and eGo-T. The clear vape tank allows for easy refilling directly from your E-Juice bottle or by using a squeezable needle tip bottle. (Blunt tip needle bottle is recommended). The tanks 2ml capacity lets you enjoy a longer period of use before a refilling is needed. The black cylinder shaped object included in your kit is a 1100mah battery which connects to your tank and supplies the necessary power enabling you to enjoy a “Puff Count” of up to 1000 before needing to be recharged. The eGot tank, also know as a CE4 clearomizer / atomizer and lasts up to 5 times longer than the poorly made e-cigarettes usually found at your local gas station which looks like a traditional tobacco cigarette. The eGo t vape pen starter kit uses a 3.7 volt 1100mah rechargeable battery with a power saving / safety function which prevents an accidental discharge and overcharging. It takes roughly 3 - 5 hours to fully charge the battery. To charge your battery, gently screw the battery into the USB cable provided in your kit. You may then plug the USB cable into any USB port on your computer. The USB cable may also be plugged into a USB wall charger with the correct power rating. The button on your ego vape pen will begin to flash for a few moments letting you its beginning the charging cycle. The light on your USB cable will be red while charging and later turn green once the charging cycle has completed indicating you now have a fully charged battery. 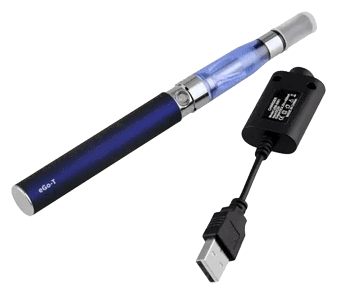 You may have already noticed your new e-cig consist of two main pieces which are the battery and the tank. To assemble: Gently screw the battery compartment clockwise onto the tank until it's hand tight. Do NOT force them to together, if it seems difficult to screw the two pieces together, simply loosen apart and retry. The battery life on the ego vape pen is quite remarkable. On only one 3 hour charge, the egot 1100mAh batteries will hold up for 10 hours of normal vaping. No more scurrying for another battery when one dies and no more taking 50 spare batteries on the go! Screw thread, compatible with 510, egot, egow, egoc battery. Please Note: You should only use the dedicated USB charger cable provided to avoid damaging the battery. Not all USB chargers are the same and may cause irreparable damage to your device. Do not use your standard USB chargers such as your Iphone charger or standard car chargers, doing so will void your product warranty. CLICK THE BUTTON 5 TIMES RAPIDLY TO TURN THE DEVICE ON. IT SHIPS IN THE OFF POSITION. 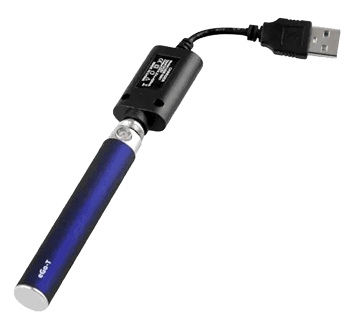 The E-Go-t starter kit is perfect for curbing my smoking needs. I believe this product does work great for my smoking needs. It stays charged with continued use. Every year I purchase 5 of these ( I break things, I lose things). Doesn't cost too much. Works for me. Thank you to Central Vapors for carrying this product! This device has a difficult draw, but that is to be expected from many ego devices. The flavor was surprisingly good, but not amazing. Vapor production is very similar to the smoke production of a cigarette. Great value! This is my second time purchasing this thing, and It broke once a again after my second week of using it.Its not charging and im not going to keep buying new ones as soon as the first one breaks. I deserve a free one or a refund. Cant beat the price. Forget the atomizer. Battery and charger for 5 bucks and receive in 3 or 4 days. Perfect for my cbd cartridges. I used this egoT for one day and it all of a sudden stopped working. I took it to a vape shopto see maybe they could tell me what was wrong with it but they couldn't fix it because it was a faulty battery. It would charge but would not fire once the pieces were connected. I ended up having to buy a whole new battery from.a tobacco shop and it works great. A waste of my money. I did buy the razzleberry ring pop e juice and I love it. I most likely won't make any more purchases from this site.